Are you looking for a new grill to buy? To help you in your purchase we are going to review theTraeger TFB30LZB Tailgater 20 Series Freestanding Grill. We want to see if it is worth buying. The Traeger TFB30LZB Tailgater 20 Series Freestanding Grill comes with a lot of features to provide you with an authentic smoky and prime grilling experience. The first thing that caught our attention about this grill is that it comes in at an affordable price. When compared to many other pellet grills, this comes in at a lower price but does that make it cheaply made? This is something we have to determine and see if it is still worth purchasing! The Traeger TFB30LZB Tailgater 20 Series Freestanding Grill comes with a standard size grilling area of around 300 square inches. This is more than enough space for a smaller-sized household, and you can fit a lot of meat or veggies on it. As with many pellet grills, this comes with a fantastic digital elite controller that allows you to have full control over the temperature inside. By setting the temperature yourself, you do not have to babysit the meat, and can just leave it. It also allows you to customize the process and what you want the meat to taste like. The elite controller has a full LED display to let you know the temperature it is at, and also keep track of your cook. The Traeger TFB30LZB Tailgater 20 Series Freestanding Grill can heat up using 100% pellets made out of hard wood. These pellets are easy to find and they are readily available on the market. Because they are made out of real hard wood, they create 100% of their flavor from the pellets. In order to start it easily, the grill comes with an auto-start ignition electronic button. 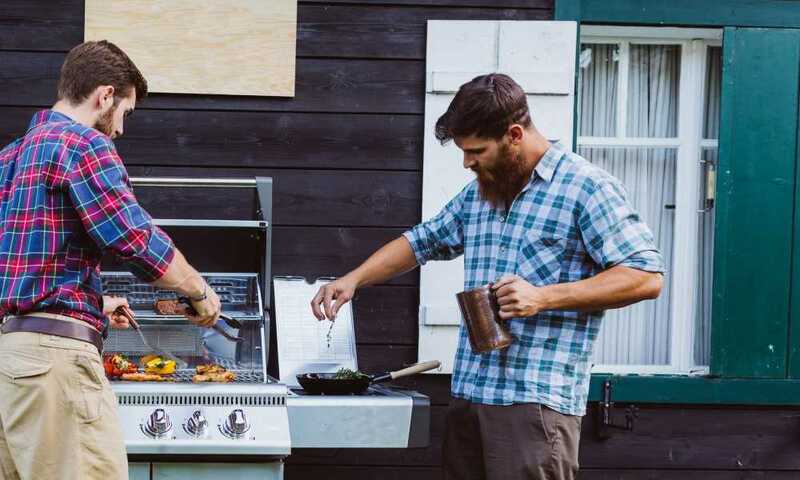 What separates the Traeger TFB30LZB Tailgater 20 Series Freestanding Grill from other pellet grills on the market is that it is concise and compact. It comes with EZ-Fold legs, so you can easily fold it up and store it whenever you want. These legs are also great for folding flat if you want to use this on a balcony or an area where you have a limited amount of space. It also comes with two wheels to wheel it around easily if you ever want to move it to another location. This grill measures 18” by 37”, by 36” and weighs just 62 lbs. That weight is basically less than half of many on the market today. Before even considering buying a new grill, we recommend that you take the time to thoroughly do your research and understand which one is going to be the best one for you. These are financial investments that can cost a lot of money, and if you are lazy about doing your research beforehand, you might end up with a grill that simply cannot get the job done. The key to finding a great grill is knowing where you are going to put it and how many people you will be cooking for, and what kind of cooking you want to do. This is going to directly influence the type of grill that you are buying and how much you are going to spend on it. It is crucial to answer many questions so you can narrow your search, especially on a website like Amazon. That being said, the Traeger TFB30LZB Tailgater 20 Series Freestanding Grill is not one of the best pellet grills on the market. The good aspects of it are that it is very concise and compact. If you have a very limited space, such as on a balcony, this is one of the grills that you may want to look at. The easy-to-fold legs are fantastic and it can fold down completely flat. However, it is not that advanced and comes with poor instructions to set it up.